With a hand over their heart and a triangular hat on their head, each American Legion Post 65 member pledged a commitment to protect America's form of government in the Villebois Community Center on a February evening. They admitted the pledge verbiage is a bit old-fashioned, but insisted it is as important today as when it was written a century ago. To them, contributing to your local community is an integral part of honoring a commitment to country — which is why service is a key function of the post. "Even today in our neighborhood here, it's up to us to be good citizens within our community, as well as within the city of Wilsonville. And if you do that, you're a good member of the community and the nation," said post Cmdr. Larry Edwards. The American Legion is a veterans organization founded in 1919 that advocated for the passage of the G.I. Bill — which provided benefits for veterans after World War II — and currently boasts hundreds of local posts across the United States. 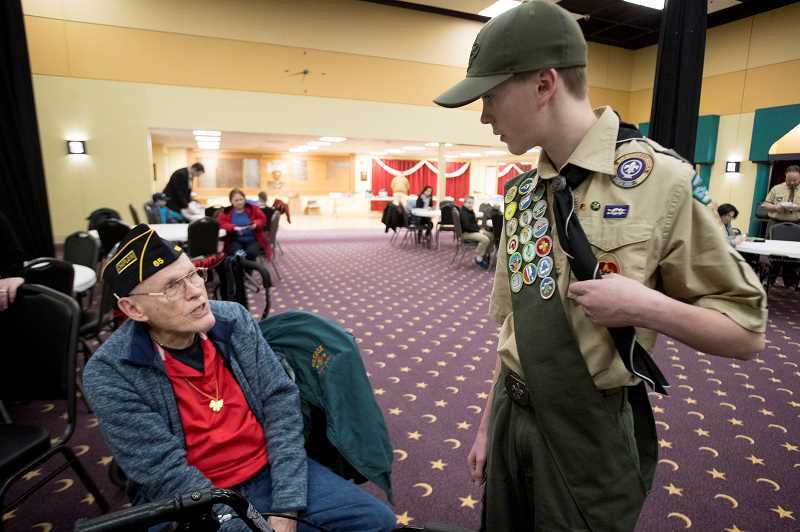 A few years ago, Wilsonville resident and Post Adjutant Larry Wittmayer couldn't understand why even though the American Legion Department of Oregon building is located in Wilsonville, he had to travel to Tigard to be a part of an American Legion post. So he and an employee of the state office began recruiting members. The post opened three years ago, later moved its monthly meetings to the Villebois Community Center, currently has 50 members, and had the highest percentage increase in membership from last year to this year of any post in Oregon. "We're gifted with that spirit of service, and I think that that's attractive to a lot of people and that's why they went into service in the first place is to serve their country," said service Officer John Molesworth. 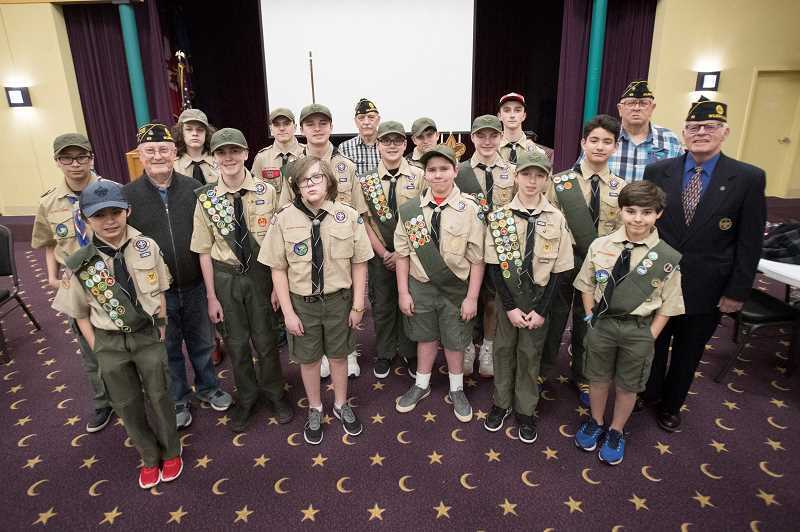 For one, Post 65 helped reorganize and provide resources for Wilsonville's Boy Scout Troop 528 and recently donated $500 to the troop to purchase equipment and $500 toward a Friends of Scouting Campaign. Wittmayer also happens to be the state's American Legion Scouting coordinator, so helping Scout Troop 528 was a no-brainer. "I just flat told them 'Come on over. We'll take care of you,'" he said. "And so far, we've really taken care of them." Post 65 also worked with the troop to restore an overgrown natural area at Boeckman Creek Primary School over a span of three Saturdays. "Getting the kids working and working beside them and seeing their confidence build as they were taking on something that was kind of overwhelming to look at ... you were able to see the progress, and by the end of it, the kids were really proud of it," Molesworth said. During the holiday season, the post provided a full Thanksgiving meal to families in the area, bought Christmas presents for one disadvantaged family, and provided cookies to local police officers and firefighters working on Christmas Eve. "It was just amazing because she was literally speechless," Molesworth said of the woman who received the presents for her children. Other projects the post has participated in include cleaning a cemetery in Wilsonville and placing memorial markers in front of veterans' graves (with families' permission), helping a veteran with post-traumatic stress disorder find housing, and providing scholarships for students to attend law enforcement and government-oriented camps. Wittmayer said many American Legion posts congregate at or even own a bar, and that becomes a big part of their identity. But without the financial means to do so, Wilsonville's post focuses most of its energy on community service. "All the posts do community service, but it's maybe a little bit more elevated in a sense of what we're about as a post," Edwards said. "That's the only reason we meet here. We can't have dinner at the club or have a beer before or after." Wittmayer said that one unique aspect of the post is its sizeable percentage of members who served in the Gulf War or later and that many of the veterans served in intelligence-gathering sectors. Located in a rapidly expanding city, Edwards thinks Post 65 can grow much bigger in the coming years. "Also, I think right here in Villebois, if we get the word out enough I would bet that there's enough veterans living right here in Villebois to double our post," he said. The American Legion has a noticeable presence in Washington, D.C., and often lobbies for reform of the U.S. Department of Veteran Affairs. Wiitmayer said bringing aboard members helps show legislators that their point of view holds weight. that are coming back from wars." Surprisingly, the Legionnaires said they don't talk about their war stories all that much. But they believe there's a common understanding among them that doesn't apply to those who haven't served. And they said this under-standing helps them get things done. "There's a connection in worldview because you realize there was a cost to all the things they have. People who haven't served don't always understand that," Molesworth said. "Hanging with veterans, you all know that it takes effort, it takes teamwork to get things done, and you go into it with that mind-set."